As US President George Bush continues his tour of Italy and France to mark the 60th anniversary of the D-Day landings, some European papers doubt the wisdom of his decision to meet Pope John Paul II on Friday. He is also warned not to overdo comparisons between the liberation of Europe in 1944 and the war in Iraq. But several commentators argue that it would be unjust if opposition to the current US president's policies made readers lose sight of the American contribution to peace in Europe. The president of the United States is paying a high price for his rapprochement with the Holy See in order to obtain the Pope's blessing for the new approach being taken in dealing with Iraq. In the Clementine Room... John Paul II revealed his hand to world public opinion. His welcome to the first citizen of the United States was warm, his homage to the sacrifice of the American soldiers in liberating the people of Europe 60 years' ago was sincere, but then came the examination of his guest's conscience. God will perhaps forgive, but Karol Wojtyla does not forget. The Pope's remarks to President Bush were, on balance, more critical than not and on balance Mr Bush will be fortunate if the visit does not lose him more votes than it won him. Bush had really hoped his audience with the Pope would give him a boost in the campaign for the Catholic vote in the presidential elections on 3 November. Now, though, his campaign strategists are worried. Such high expectations, and then such leniency. 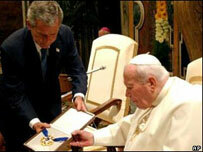 John Paul II did not give Bush a piece of his mind at the audience in Rome. Yet their meeting clearly set out their relationship. Here is the mightiest commander-in-chief on Earth, who for all his divisions cannot bring a country like Iraq under his control... And there the Pope as the moral authority and who for many has been the real leader of the peace movement in the Iraq conflict. Tomorrow's commemoration of the 60th anniversary the Normandy landings... will give Bush the images of gratitude and friendship which he so needs in an up-hill election campaign... It is incorrect and imprudent, however, to draw a parallel between the liberation of Europe in 1944 and the intervention in Iraq in 2003. There will be demonstrations by those who only see in Bush a "war criminal" instead of the representatives of Europe's liberators. George W Bush is not the USA. If in Normandy on Sunday the president of the only remaining superpower receives the thanks of the people of Europe for liberation from the Nazi terror, then these thanks belong to the descendants of Franklin D Roosevelt and not the commander-in-chief in Iraq. This must be borne in mind, because Bush mentions the two military campaigns in the same breath. The president of the United States has timed his European visit well. The anniversary of D-Day is the most unsuitable possible day for an anti-American protest in France that could be imagined. Europe shares the same ideals as America. To defend them together is in the interests of both sides, which have to resist two opposing temptations: the Americans, to go it alone; the Europeans, to remain passive. It would be unjust if Bush's errors were to make people lose sight of the great contribution that America has made to the peace and well-being enjoyed by the Old Continent today. We must not be under any illusion following the agreed statements issued before George W Bush's arrival in France today. The gap between the US president and his French counterpart which opened in 2003 has not yet been bridged. But it can be narrowed. The calendar of History offer both men... a fine opportunity to celebrate what is most sincere and noble in Franco-US relations, and erase the memory of recent, very petty episodes. We would like to hope that the past, for once, will rejoin the present and that a "breath of Normandy" will guide future international politics. It's not the time for polemics: it's not Bush, it's the American people that we're thanking... it's not Chirac, Blair or Schroeder who are being honoured. All these men are, on this day, only bearers of this rare sentiment of freedom regained that is the legacy of 6 June 1944.